I was recently asked what do you call the maps (see figure 1) that are produced by the mapping technique I developed? Are they Digital roadmaps? Product roadmaps? Strategy maps? Chessboards for business? First, the maps cover activities, practices and data and aren't limited to a specific field such as technology. They can be used to identify common services, differences, areas of efficiency, potential strategic gameplay, solve communication issues and ... a long list. Hence all the above terms are inappropriate. Second, I created the technique at Fotango in '05 after determining a basic pattern of evolution at Foo in '04. I've refined this since then, finally determining a clear and demonstrable pattern of evolution in 2007. Third, during all this time I have provided the mapping and evolution work under creative commons and given this freely to the community. If you really wan't to give the maps a name - well, I'd appreciate some kindness back and recognition of my effort. Hence, if they need to have a name, I'd be grateful if you could call it a 'Wardley Map'. It has the advantage of not limiting the technique to a specific field as the maps are generally applicable in multiple different spheres. That said, my absolute preference is for them to be just called Maps. 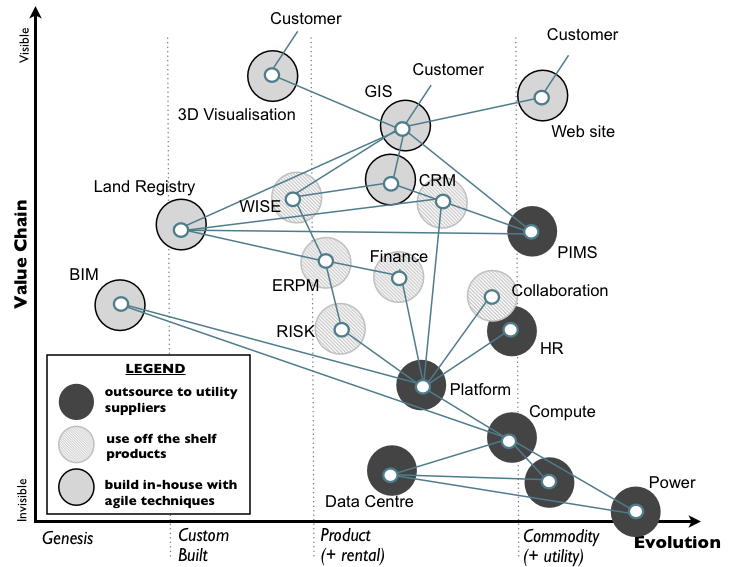 I'd also be perfectly happy if you called them 'Wardley-Duncan maps', in homage to @jamesaduncan who was an important influence in the creation of them back in 2005-2006. My preference however, is that you just call them 'Maps' and don't stick other terms like digital, strategy etc onto them. Whilst I'm at it, an alternative to the ILC model is the 'Wardley-Thompson Technique' in homage to the important influence that Mark Thompson had in refining the model back in 2010.